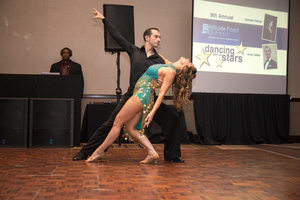 Hillside Food Outreach will host its 11th annual Dancing with Our Stars on Saturday, March 30, at the Ethan Allen Inn to benefit its work in ending hunger in Westchester, Putnam and Fairfield Counties. Hillside volunteers deliver healthy and nutritious foods to over 2,000 men, woman and children in need. In total, Dancing with Our Stars has raised over $250,000 since its inception and the Arthur Murray of Danbury studio has been its longtime partner in this event. Arthur Murray instructor at the event. then her son, completed the family trifecta of dance champions, raising a whopping $19,500. “Hillside changes people’s lives!” she said. This year’s dancers include Fairfield’s Monika Popovicova, Hillside supporter; David Arconti Jr, State Representative, Danbury; Paul DiNardo, Danbury Police Dept., retired; Angela Wong, Danbury City Center executive, Danbury; Suzanne Mercurio, Hillside volunteer, Danbury; Mary Anne Scrobe, fitness instructor, Yonkers; Victoria Drozdov, philanthropist and volunteer, Westchester; Carlo Covles, a pharmaceutical executive in New Jersey; and Will Wade, owner of Nissan City auto dealership, Port Chester, N.Y.